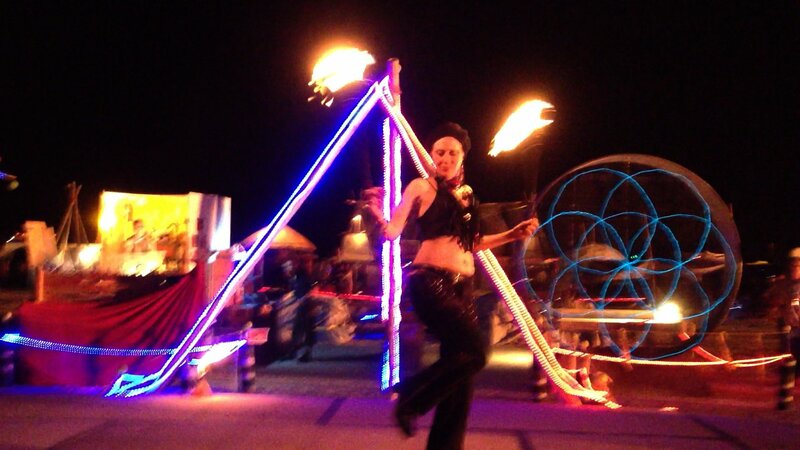 For Cargo Cult, we called in a cargo of fire – as many kinds as we could muster! 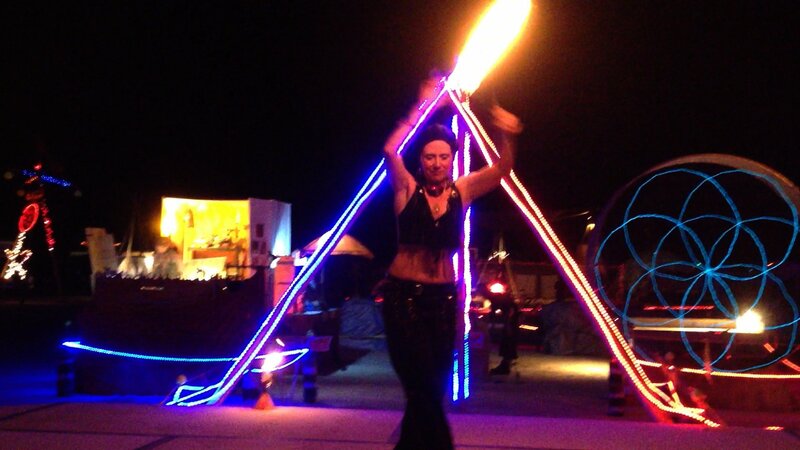 The result was UniFire, a unification of the masculine/feminine and all of us, through all kinds of fire. UniFire featured a 24’x12’ Playatech fire performance stage, a Playatech DJ booth, and two Playatech pillars containing speakers and flame effects controlled by the DJ. 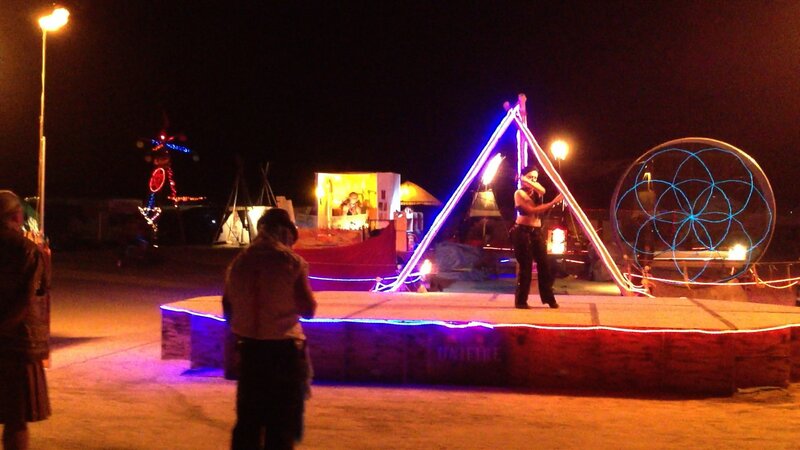 Behind the stage, we built a large performer staging area with a fuel depot, safety gear, and Zach Mallon’s super-cool Fuel Reclamation Project spin-out ring. 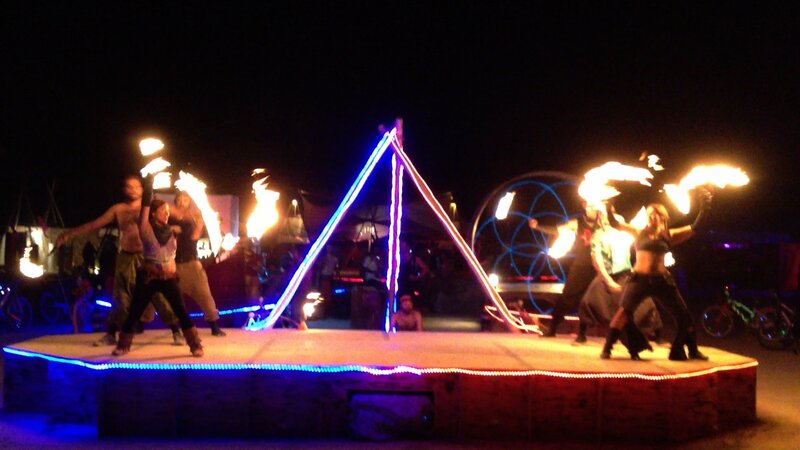 In front of the stage, we installed Sunshine’s sweet fire cauldron with Playatech benches around it. Right behind that rose Gary Evans’ “Threshold”, two twenty-foot high tipi-like effigies – one an enclave for healing with the masculine and the other with the feminine. 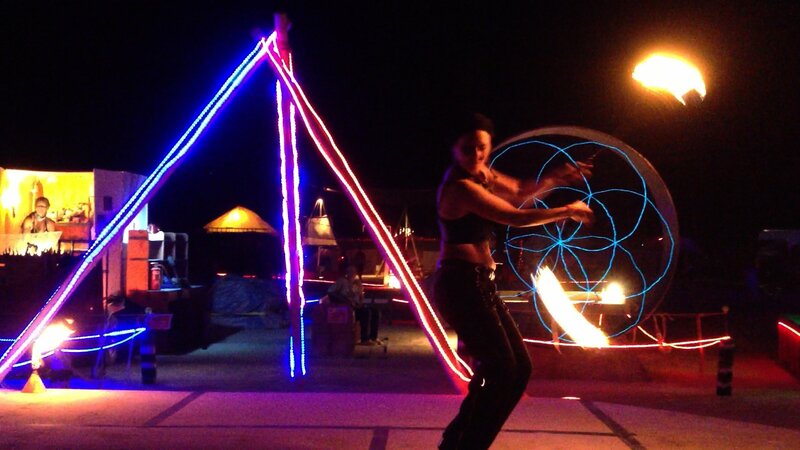 The entire installation was lit with red LED rope on one side for the feminine and blue LED rope on the other for the masculine, which came together to form white light in the middle. 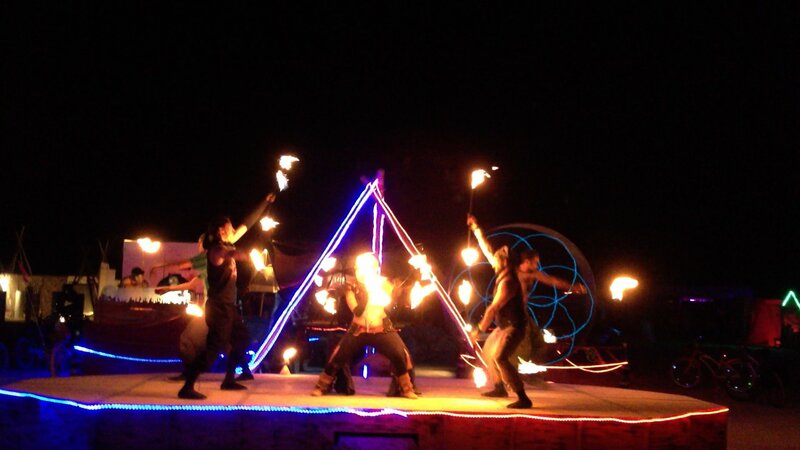 Every night from Tuesday through Friday, DJs rocked the playa while fire performers lit up the stage, propane poofers fired from each side, and a bonfire roared in front. You’d think a huge fire, light, and sound installation like UniFire right on the Esplanade would be obvious, so we were amazed at how many bike riders drove right into things, like the flaming fire cauldron. LOL & OMG, playa rule number 3 is “pay attention in the direction you are moving”! Luckily no one was hurt. On Friday night, we filled the Threshold tipis with gasoline and ran slow fuses from the ground to their tips. Following a fire dance involving a battle and reconciliation of the masculine and feminine, the performers lit the fuses. We watched in near-silent contemplation for ten minutes as the fuses raced to the top in excruciatingly slow motion. 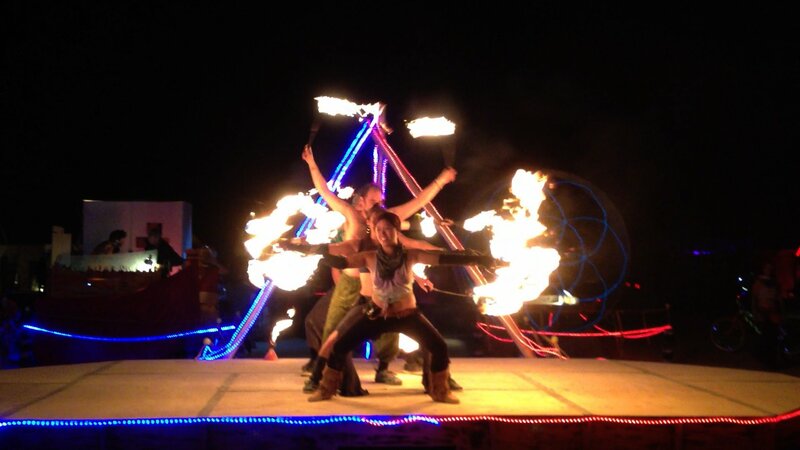 Finally, the feminine tipi let loose, fire shooting from the top and then dropping down to engulf the effigy. The masculine followed shortly thereafter, and in true form, fell first. For more information, see Facebook/UniFire. 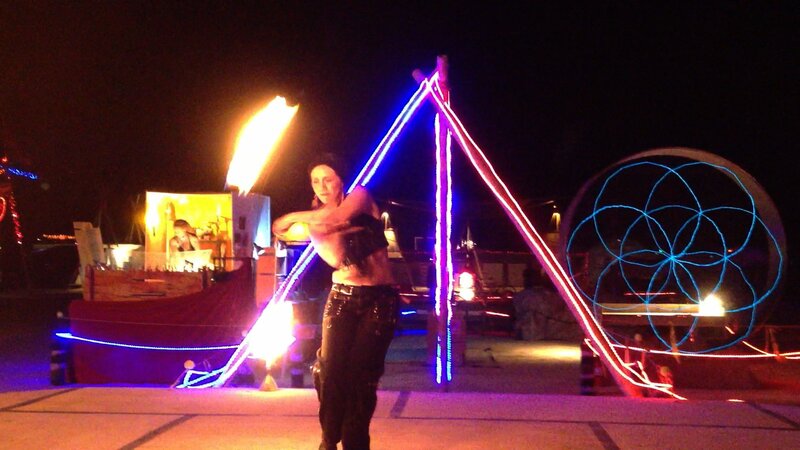 We’d like to thank Red Lightning camp for hosting and sponsoring UniFire, and send HUGE appreciation to the hundred or more fire performers, DJs, builders, production team members, and others who came together to make this massive fire unification happen. And leave no trace of it.